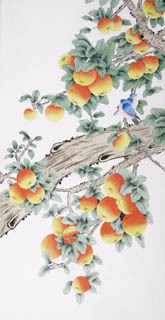 Chinese other fruits paintings include persimmon painting, mandarin orange painting and loquat painting, etc. 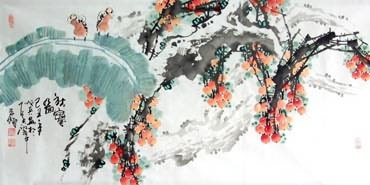 Chinese Persimmon Fengshui Painting: The persimmon, which is colored a light red and has much the appearance of an apple. 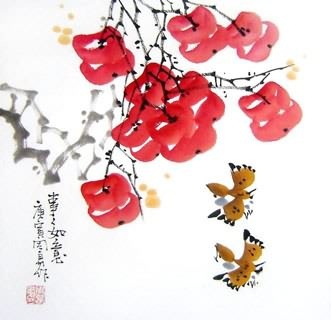 Owing to its bright and festive color the persimmon is an emblem of joy. 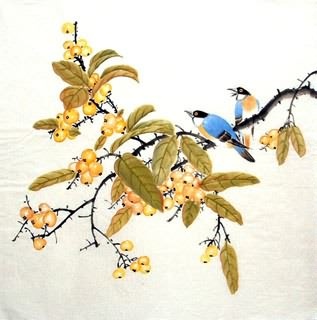 百事大吉 Persimmons are usually depicted with lily's bulb and tangerine to symbolize good fortune and great profit. 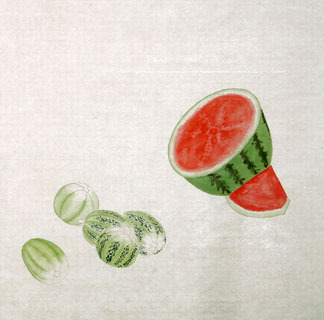 Another common grouping is persimmon with watermelon, grape, and perch. 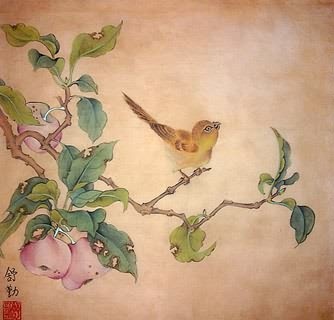 四时报喜. 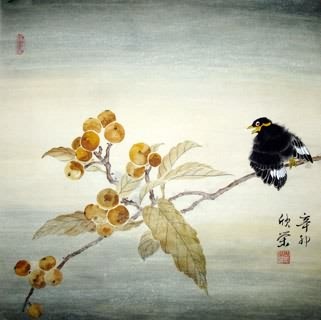 This combination means that there are always good news. 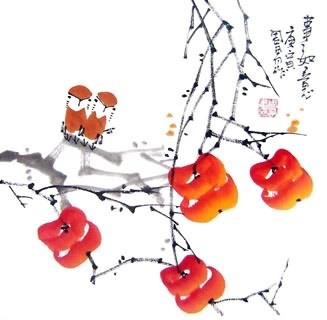 When five(5) persimmons are combined with crab apple blossoms (haitang 海棠), 五世同堂, they convey a wish that five generations alive at the same time. 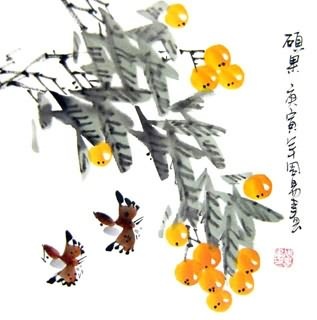 Chinese Mandarin Orange Feng Shui Painting: The mandarin orange is most popular in China. 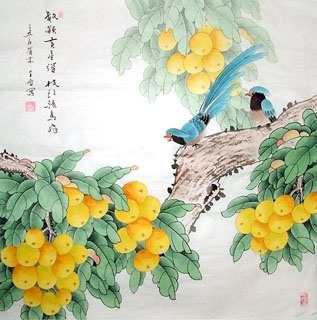 Both the flavour of the fruit and the golden yellow of the exterior are much appreciated.This fruit was formerly used in imperial sacrifices to Heaven at the beginning of the year, and tribute of oranges was sent to Peking from Foochow annually for that purpose. 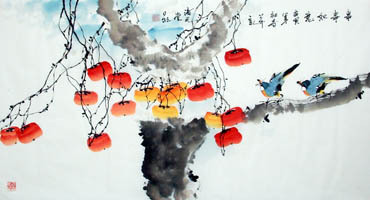 The presentation of oranges at China New Year betokens the wish for abundant happiness and prosperity. 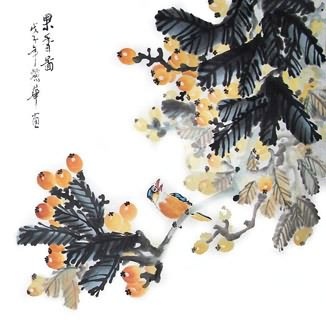 When you find a picture of mandarin oranges combine with two catfishes, 年年大吉, you're looking at a popular design that can be translated as "highly auspicious every year". 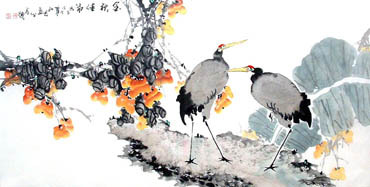 This is because the Chinese name for catfish is nianyu (鲶鱼), "鲶 (nian)" homophonous with the "年 (nian)" that means "year." 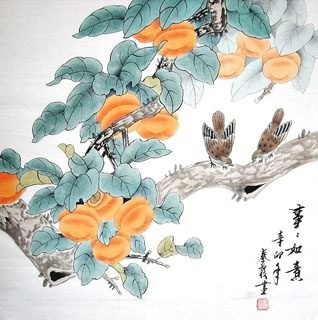 And the mandarin orange symbolizes auspiciousness. 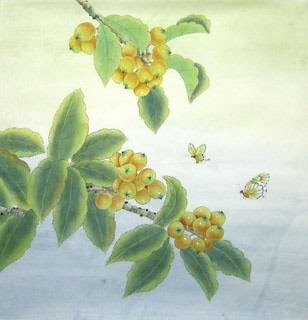 Chinese Loquat Fengshui Painting: Loquat, known as the good fruitis of the energy of all seasons, was considered as the auspicious thing that represented a happy life. 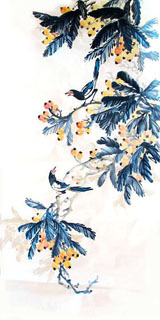 InkDance Price: USD 459 /GBP 377 /EUR 437 Sold, you can customize it.